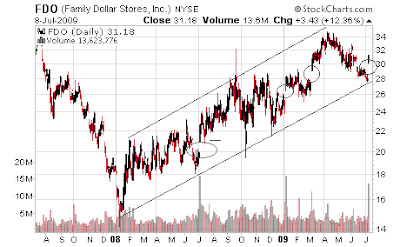 Family Dollar FDO looks like growth at a reasonable price and is still a recession resistant company. Institutions really loaded up yesterday with some nice blocks. That volume was higher than it has been for 5 months. I like the steady uptrend that always reacts to the trend lines I drew. The circles I made are gap up days. Very consistently after a strong gap up day like we had yesterday and big volume spike the stock has kept getting picked up. Guess what this gap up and volume spike on trend line support yesterday tells me the stock is going to do? Take that with the fundamentals and this is a good entry.